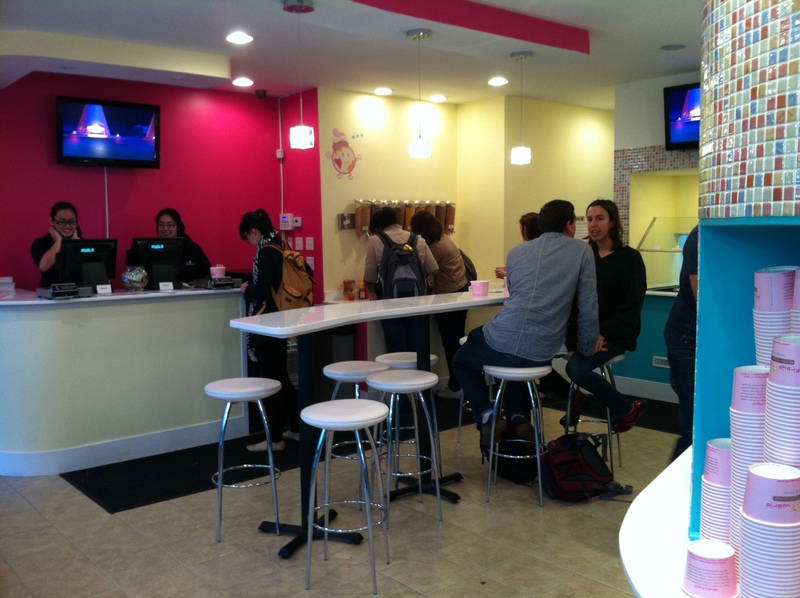 Froyo World opens a new location on Thayer Street which is already bustling. Some people may question why Froyo World opened a frozen yogurt shop on Thayer Street when we already have Juniper, but not me. I’m ready for the Red Mango, the Pinkberry (please, when?) and any other willing competitors. That said, I did feel a little guilty sidestepping Juniper to try Froyo World. Froyo World follows the self-serve model, which means the cups are intentionally enormous so that you might foolishly load them up with yogurt and toppings — $.49/ounce sounds cheap but it adds up. What I like about this is that I can try as many flavors as I wish — original tart (not as good as Juniper), chocolate and vanilla swirl (convincingly similar to soft serve ice cream and presumably less fattening than Frosty Freez), and peanut butter (sensing I’ll be craving this later). You’re also not penalized for more than two toppings — and I’m still scratching my head at why Juniper charges $1 for a sprinkle of chocolate chips. Still, Madeline remained unconvinced and insisted on getting her “old” blueberry yogurt with gummy bears and strawberries at Juniper. So we actually went to both places — good thing they’re so close together. froyoworld is a lot better than Juniper in my opinion. the whole point of it being frozen yogurt tasting like soft serve is for people to acquire the taste better. you just said something positive and made it negative. don’t be a hater. their cups aren’t intentionally enormous. they have 2 sizes plus its self serve.you control your own portion. you can get little as like a buck or two. if youre going to write an article..at least be nice..and don’t compare 2 businesses who have totally different concepts and taste. frozen yogurt is NONFAT so obviously its less fattening than frosty freez. Glad to see I’ve garnered some wrath. 🙂 Although a ‘hater’ of frozen yogurt is not something I would call myself. Froyo World’s cups are cartoonishly large especially if you’re planning to only get a dollar or two of yogurt. I still go there all the time and find I usually spend half what I do at Juniper. Still, I go to Juniper more because I like their tart original yogurt better, but I’m happy both places are able to co-exist and hope it stays that way. The more choices in my opinion, the better! On my search for frozen yogurt, I happened upon Froyo World. Which is to say I stepped off a narrow, crowded sidewalk into a magical kingdom of pistachio green and cotton candy pink decor. The soft sunrise yellow and sunset pink cups were pleasing to the eye and spirit. Pink cup in hand I embarked on what proved to be a delightful journey into the world of soft and cool (it was 81 degrees outside). I then lingered over the colorful choices of toppings. My cup now runneth over. Sitting on a saddle-style stool, facing a window toward the world of Thayer Street, I marveled at each delicious bite of fro yo and fruit-occasionally-turning my eye toward the inside-I could not help but notice that the DVD playing was-befittingly- “UP”.